Ali and Rachel's love story is like reading one of the most well scripted episodes of everyone's favorite sitcom. It starts off with meeting at an event that most of us know the name of and few of us have ever seen, the Kentucky Derby. In a weekend of fun and friends (and admittedly a few libations) somehow Ali and Rachel happened to meet each other among the crowds. Later to find that they have been living the idea of six degrees of separation until that fateful Derby weekend. I mean these future wives went to the same schools, lived streets away from each other and never met until fate decided to interfere. The two began seeing each other regularly and that magical process of getting to know your other half through late night talks, casual car rides, and glasses of wine quickly ensued. One topic they kept coming back to was their love for the Mountains of Colorado. So it was only natural that when plans to hold a big, traditional wedding bash in Kentucky fell through, they decided to live out another dream of having an intimate wedding in some serious Sound of Music scenery. Can we just say that gosh, they did their love right. Waking up to rainy dawn in Estes Park, Ali and Rachel began a slow morning of wedding prep. They did what we wish every couple would do, enjoyed their day and lived their moments. I mean Elk watching, breakfast, hiking, and attempted to stave off the rain with "Isn't ironic lyrics" is seriously such a perfect start to the rest of your lives together. Ali and Rachel said their "I Do's" in front of a small group of from and family at the YMCA of the Rockies. Post nuptials, they jumped in the car with Janea and headed up to one of our favorite spots, Trailridge Road. 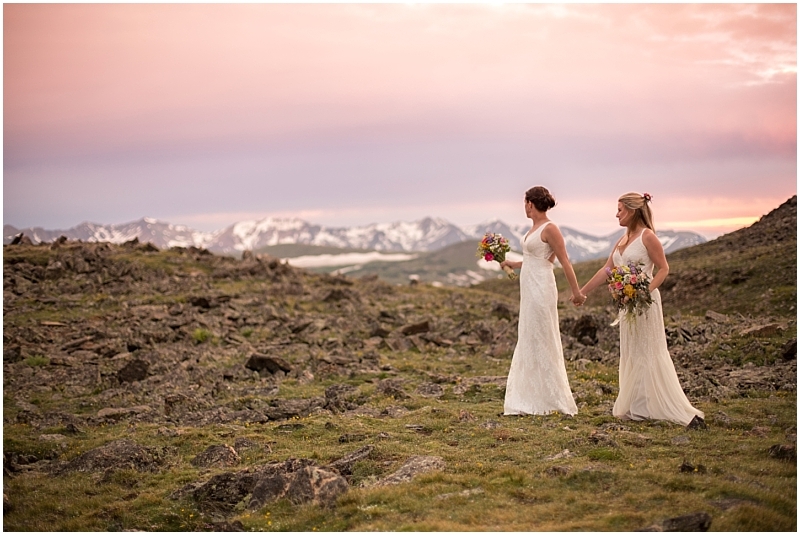 While popping some champagne to celebrate their union they posed, laughed, cried and were greeted by one of the most perfect cotton candy Colorado sunset. We still think the sky coloration was Colorado's way of acknowledging not just their marriage but their beautiful souls. Congratulations again Ali and Rachel, we can't wait until you come back to visit us! Special thanks to these amazing professionals!